JDS 2010 is now OPEN, but NOT for everyone! JDS 2010 is now OPEN, but NOT for everyone!, originally uploaded by វ័ណថារិទ្ធ. 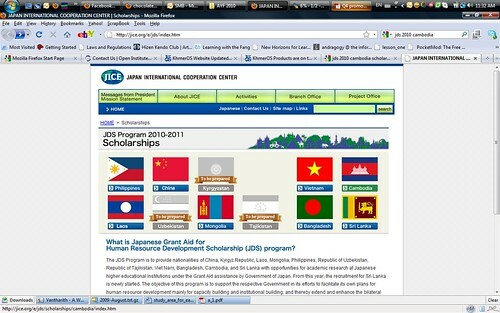 From Japanese Fiscal Year 2009, it was decided that the open recruitment of candidates is NOT implemented. Instead, only the applications from those who are officially nominated by responsible organizations (so called, “Nominate Organization”) are accepted to the program. Therefore, applications from those who are NOT officially nominated by the designated Nominate Organizations will NOT be accepted. This system applies for all applicants, Public Servant and Private Sector, so the application is accepted as long as the applicants are officially nominated. Japanese Grant Aid for Human Resource Development Scholarship (JDS) was first implemented in the Kingdom of Cambodia for Japanese fiscal year (JFY) 2001 by the assistance of the Government of Japan. 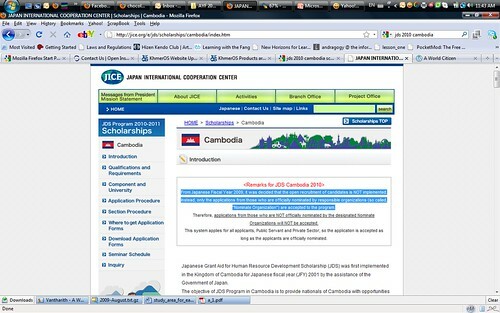 The objective of JDS Program in Cambodia is to provide nationals of Cambodia with opportunities for academic research at Japanese higher educational institutions (hereinafter refereed to as “universities”) in order to support the Royal Government of Cambodia in its efforts to facilitate its own plans for human resources development, mainly for capacity building and institutional building. And thereby it extends and enhances the bilateral relationship between Cambodia and Japan. The JDS Program targets young Public Servants and others who are expected to engage in formulating and implementing social and economic development plans with the potential to play leadership roles in their specialties after their return to Cambodia as well as to become leaders in Cambodia in the 21st century. Under this program, Master courses in English at Japanese universities will be provided mainly for the Public Servant. For the JDS project in Cambodia, the “Components (≒Development issue to study)” are set as follows. In addition, mainly Ministries are set under the each component as “Nominate Organization and all applicants must be nominated by one of the Nominate Organizations in order to apply for JDS. (See “Application Guideline” in detail). For more info, please visit official JDS page.